Newly completed facility includes a fully-certified Dolby Atmos studio and much more. 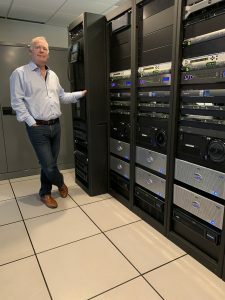 SAN FRANCISCO—One Union Recording Studios, the premiere provider of post-production sound services in the Bay Area, has completed a total rebuild of its facility in San Francisco. The finished site features five all-new, state-of-the-art studios designed for mixing, sound design, ADR, voice recording and other sound work. Each studio offers Avid/Euphonix digital mixing consoles, Avid MTRX interface systems, the latest Pro Tools software PT Ultimate, and robust monitoring and signal processing gear. All studios have dedicated, large voice recording booths. One is certified for Dolby Atmos sound production. The facility’s infrastructure and central machine room are also all brand new. During the 18 months of reconstruction, One Union carried on operations on a limited basis, while maintaining its full staff. That included its team of engineers, Joaby Deal, Eben Carr, Andy Greenberg, Matt Wood and Isaac Olsen, who worked continuously and remain in place. Reconstruction was managed by LA-based Yanchar Design & Consulting Group, a specialist in design and engineering for sound facilities. The rebuilt studios conform to the highest industry standards and are equipped with top quality components. All five studios feature Avid/Euphonix System 5 digital audio consoles, Pro Tools 2018 and Avid MTRX with Dante interface systems. Studio 4 adds Dolby Atmos capability with a full Atmos Production Suite as well as Atmos RMU. Studio 5, the facility’s largest recording space, has two MTRX systems, with a total of more than 240 analog, MADI and Dante outputs (256 inputs), integrated with a 9-foot Avid/Euphonix console. It also features a 110-inch, retractable projection screen in the control room and a 61-inch playback monitor in its dedicated voice booth. Among other things, the central machine room includes 300TB LTO archiving system. One Union Recording was founded by McGleenan, a former advertising agency executive, in 1994 and originally had just one sound studio. More studios were soon added as the company became a mainstay sound services provider to the region’s advertising industry. In recent years, the company has extended its scope to include corporate and branded media, television, film and games, and built a client base that extends across the country and around the world. Recent work includes commercials for Mountain Dew and carsharing company Turo, the television series Law and Order SVU and Grand Hotel, the podcast series Root of Evil and the game The Grand Tour. Located in the heart of San Francisco’s advertising district, One Union Recording Studios began in 1995 with a single studio. Today, the company boasts five state-of-the-art studios, serving as top-notch resources to the world’s premier advertising agencies, brands, television and film studios, game developers and production companies. One Union prides itself on bringing projects to life. We offer superior technical knowledge, craftsmanship and expertise, and a dedication to building relationships.